This is about the "Lieberman-Warner Climate Security Act," S. 2191. In the 1930's the Government needed to control everything because the economy was bad. In the coming years the Government will need to control everything because the environment might be getting bad. I've lately been reading The Forgotten Man by Amity Shlaes, which chronicles ways in which government control of everything during the Great Depression made matters worse. Now here come some very smart people (might one call them a "brain trust?") promising to destroy the economy in the name of saving the environment. This is supposed to be a Good Thing. Power Line links to the WSJ and the Chamber of Commerce. The horrifying chart of the proposed new bureaucracy is even more horrifying viewed full size. (Inline update: That chart is a part of an even larger chart! Thanks to Chris Horner at Planet Gore.) The size of this proposal is like one of those things that Carl Sagan wrote about, incomprehensibly enormous. Billions and billions of billions and billions. Some of these Congressmen who write these regulations don't seem to realize that every bureaucrat, every regulator, every paper-pusher, is someone who is not doing something constructive, but something obstructive. Or … do they? How can such smart people be so dumb? That's a rhetorical question. Update: Similar thinking in the British Parliament. Environment Minister Hilary Benn again rebuffed calls this week for WW2-style energy rationing to return to the UK. He was responding to a Select Committee report urging ministers to issue 45 million Britons with an energy trading "credit card" - a mammoth techno-bureaucratic exercise costing several billions of pounds a year to operate. However prettily the MPs would like to dress up rationing, it's fundamentally a form of social coercion designed to make people less comfortable than they were before. Wartime rationing needs a war-sized scare, and with the climate stubbornly refusing to conform to the computer models (which predict catastrophe) that looks like an impossible prospect. Another update: S. Weasel has posted on this, with a charming graphic. Blue Planet in Green Shackles. Luboš Motl has a link to video of Klaus addressing the National Press Club. I could not get it to play; maybe your luck or skill will be better. I do not see the future threats to free society coming from the old and old- fashioned communist ideology. The name of the new danger will undoubtedly be different, but its substance will be very similar. Like their predecessors, they will be certain that they have the right to sacrifice man and his freedom to make their idea reality. In the past, it was in the name of the Marxists or of the proletariat; this time, in the name of the planet. Structurally, it is very similar. The current danger, as I see it, is environmentalism and especially its strongest version, climate alarmism. Or, "everything old is new again." While looking around for something for a Memorial Day note elsewhere (I finally settled on "Decoration Day" by Longfellow), I came across an 1805 piece by Francis Scott Key. This one might be due for a revival. Everybody knows the tune. You eat the cheese, maybe with crackers. Those in the picture are oatcakes. Carr's Wheatmeal biscuits are good for this. You drink the wine. 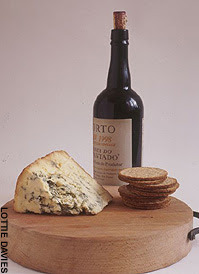 You do not make a paste from the cheese and the wine and then spread it on the biscuits. No, no, you do not do that. Capers and sprats could not do any harm; a gherkin might go well. Click the pic for a recipe for port wine jello! (Oh, all right, jelly.) And another recipe for sake-wasabi-oyster shots. Although with that one, once you know the ingredients, you don't much need the recipe. Myth 3: You can out-drink the bartender. A more wrong statement has never been uttered; you can't, so don't even try. But, if you're buying, I'll certainly entertain the challenge. I don't care how much you think you can drink—any bartender anytime, anywhere can put you under the table, period. But need clear heads to mix your heady brew. We kitsch it if we swig it too. Rigor lone is rigor mortis. That beats the chic hare of Rive Gaucherie. Believes itself. Then it's bunk. Art, being bartender, is never drunk. Before I Google'd up that poem, I had remembered that last line as "Art, like the bartender, is never drunk." Now I suppose I'll be the only source for that quote on the whole darn Interweb. Is that actually a different line, from another work? Anyone who can set me straight on this, please do. If Iranians would still do this today, they might have a more sensible take on the world. Do MADD and their prohibitionist fellow-travelers ever notice how toxic becomes the worldview of whole societies where drink is prohibited? I suspect not. Teresa Nielsen Hayden recently linked to a description of Narcissistic Personality Disorder. She was intending to say that Internet trolls display this syndrome, and I'm sure that many of them do. But as I look through the document, I see Arafat and Ahmadinejad in every paragraph. I wonder if an entire culture can suffer from a personality disorder. and February of 1977. That's where I would have read it. The longer, full version of the novel was later published as Our Lady of Darkness. 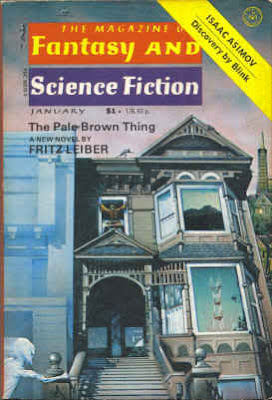 Cover image swiped from SciFi Buys, an amazing (!) source of vintage magazines, to which I shall be returning, now that I've found it. Senator McCain gave a speech in Portland, Oregon Monday reiterating and explaining his longstanding support for a “cap-and-trade” approach to global warming. He proposes that the government require reductions in greenhouse-gas emissions but allow companies to trade emissions credits, supposedly creating an efficient, market-based distribution of the regulatory burden. Support for this policy is the biggest mistake his campaign has made so far. Mr. McCain's virtues are many, but he's a politician. Yet, happily, the spheres are moving and whatever energy boondoggles are coming, they are likely to be less costly than the boondoggles that might have been enacted even a year or two ago when Al Gore was riding high. For this, we will be able to thank the climate gods and no one else. I fear Jenkins may be overoptimistic. Bjørn Lomborg has some things to say about McCain in an interview with Kathryn Lopez at NRO. Short excerpt here; full interview here. John McCain’s daughter recently told GQ magazine that her dad is “freaked out” by climate change. Just another batch of things that caught my eye. Drug war casualty: "Marie Walsh was the very picture of American suburban respectability. She and her husband, a company executive, lived in a £400,000 house in an affluent area near San Diego, California. But the 53-year-old had a secret that even her husband and three children did not know: she was really Susan Lefevre, a convicted drug dealer who had been on the run for 32 years after escaping from the Detroit House of Corrections." Fierce comment threads at Althouse and Volokh on Ayers and Dohrn, and Barack Obama's relationship with them. The Althouse thread inspires a post by Blake: Terrorism and Indoctrination vs. Education, which gets some silly comments by yours truly. Adopted Man Finds Biological Father on Death Row. PSA from Hungary intended to promote bicycling. Looks pretty persuasive to me. Strange But True photos at the L.A. Times. ROFLcon. Sounds like fun. Over, though; it was held the last weekend in April. The blog includes a list of Sleeper Hits of the Internet, a bunch of (mostly) fun videos that you may have missed. And that seems to require a mention of ROFLMAO. "Do-doo-do-do-do." The approaching Singularity is seen from another angle. "The memristor is our salvation, because it works better and better as you make it smaller and smaller," said Chua. "The era of nanoscale electronics will be enabled by the memristor. This is not just an invention, it is a basic scientific discovery. It has always been there -- we just had to face these nanoscale problems to realize its importance." The memristor behaves like a non-linear resistor with memory -- a small, compact and highly energy-efficient means of creating a memory device. But Chua and Williams claim it is also a new type of circuit element that should enable the creation of new devices never before imagined. Read the whole thing. By way of Jerry Pournelle's mail. It was a very fraught year. One that makes sense, for a change. 6. Don't listen to your elders! After all, if the old person standing up here actually knew anything worth telling, he'd be charging you for it. since commencement speakers may indeed be charging for their services. The most satisfactory charge for some is sheer egoboo, of course. But there may be honors involved, or even large sums of cash. Lots of comments at Hot Air. The Summer is a-comin' in, the Winter's gone away, oh. Flatpick and fingers at the same time. It's tough, but Tommy Emmanuel makes it look like a piece of cake. The piece is called "Angelina." Some forum discussion on this. Thanks, Charles!